For those who love the sunset side of the state on Lake Michigan, consider a beach on the sunrise side on Lake Huron. One outstanding choice is Lighthouse Park in Port Huron. As the name suggests, this county park boosts the historic Fort Gratiot Lighthouse and the 900 feet of beach is sandy with easy access to the waterfront. Lake Huron near the park has a strong current so it is especially well-suited to strong swimmers who enjoy a challenge. Also on the sunrise side but farther north is P.H. Hoeft State Park, near Rogers City, a more remote locale that in 2017 the Detroit Free Press called “… in some ways the best public beach on the U.S. side of the lake.” The 300-acre park with a mile of sandy beach is great for ship watching, swimming, strolling, rock and shell hunting, and camping, and is rarely crowded. When you’ve had enough sun, you can take a side trip to Mackinaw City, just 50 miles away. For those interested in wildlife and habitat, Sturgeon Bay Dunes near Carp Lake, is a preserve located within Wilderness State Park at the northwestern tip of the mitten on Lake Michigan’s Sturgeon Bay. The beaches are rugged but sandy, the wildlife includes the endangered Piping Plover and four threatened plant species, and the North Country Trail traverses the park. It’s a remote but enchanting place to enjoy a quiet sunny day with friends. Petoskey State Park is on beautiful Little Traverse Bay between Harbor Springs and Petoskey, two of Michigan’s top summer meccas. In its entirety, the park covers 303 acres and includes two separate campgrounds as well as one of the state’s most perfect beaches on the bay. Your group can add to its local knowledge with a visit to the nearby Oden Fish Hatchery, one of the most advanced facilities for raising brown and brook trout to be found anywhere. Hard to reach but well worth the exercise is North Bar Lake with sandy beaches bordering its warm and relatively shallow sides, and Lake Michigan just a few hundred feet away. Part of the treasured Sleeping Bear Dunes National Lakeshore, the beaches are superb for rock hounds looking for Petoskey stones. If a walk is on your to-do list, you can stroll north to the bluffs below the breathtaking Pierce Stocking Scenic Drive overlook platform that will give you a bottom-to-top perspective on how massive and steep the dunes really are. Ottawa County’s Tunnel Park is a great Lake Michigan beach park that is near Holland but less packed than the extremely well visited Holland State Park. Just 22 acres, Tunnel Park is a great place to spend a day, swim, play a little Frisbee, enjoy a picnic, and climb the dunes for gorgeous scenic views of the lake. Also available are sand volleyball courts, a horseshoe pit, and a children’s playground. Grand Mere State Park is a well-kept secret in Michigan, although lots of out-of-staters know it well as it is not far from I-94 as it cuts through Berrien County from points in Illinois and Indiana. If your group isn’t familiar with the southwest corner of the state, Grand Mere, near Stevensville, is a great place to begin. The 985-acre park has one mile of gorgeous sandy beaches on southern Lake Michigan as well as the Grand Mere Nature Trail for walking/hiking and three inland lakes surrounded by undeveloped, natural scenery. 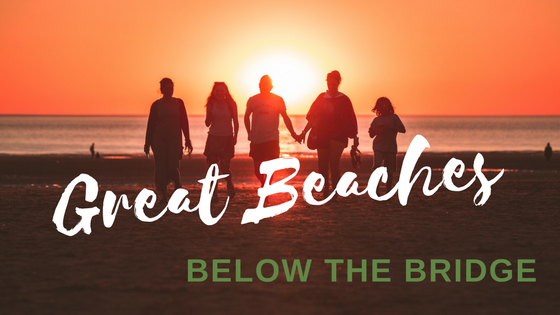 These are just a few of the many state, county and local beaches we Michiganders are so lucky to have access to all summer long. As the longest-running family-owned charter bus company in Michigan, we know the drill and can get your group to the beach of your choice for a wonderful day with wonderful memories. Learn more about our charter services today and start packing your beach bag!